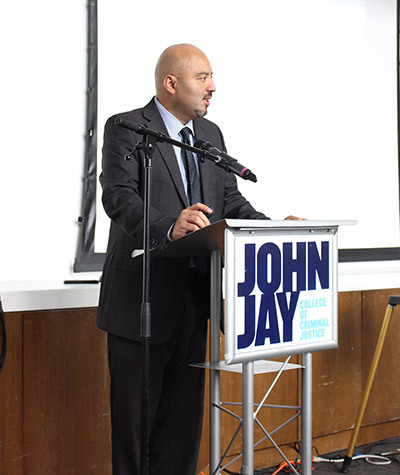 As part of the HSI speaker series, Xavier Perez, Ph.D., Director and Co-founder of the Criminology program at DePaul University, came to John Jay College to change the narrative surrounding criminality. During his presentation, Critical Perspectives in Criminology: Moving beyond the Rhetoric of Law & Order, on March 25, 2019, Perez told the audience his redemption story, from incarcerated youth to his career at DePaul, and provided his listeners with solutions to change the way criminality is perceived and how to include marginalized voices in the conversation. On one of these trips, Perez recalled seeing a beautiful mural filled with gang symbols outside the detention center. And, although his initial thoughts were about his life of crime and the success that he may one day have, he wondered what his life would be like if he listened to the people who always saw potential in him, like Mr. Kuhn, his high school history teacher. Remembering back on one of his many interventions—he dropped out of high school three times—Perez spoke about the words Mr. Kuhn told him. “He said, ‘Xavier, you know the one regret I have in life? It’s that I'm not going to see you when you are shining. I'm not going to see you when you are great.’ These are words that have always resonated with me.” Taking this conversation to heart, Perez applied himself in school and went on to attend the University of Illinois, earning his Ph.D. in Criminology. While Perez sees the way his life has changed, he recognizes that not everyone is so lucky. When speaking about his success story, he brought up this idea of merit within society. “We like to think about society as being one of individualism and merit, and pulling myself up by my bootstraps, but I certainly will challenge that idea,” he said. “I did not arrive to where I am by myself. Not at all. There was an absence in my growing up and in my family. But that absence was filled by programs, individuals and the high generosity and commitment to me as an individual.” This is why, according to Perez, he teaches Criminology, because he understands that without the help of community and the individuals within the community, youth in the criminal justice system will forever be stuck in a vicious cycle of incarceration. When the term “criminology” was first defined, there were two main schools of thought: the positivist school and the classical school. The former, led by “the father of criminology” Cesare Lombroso, believed that criminal behavior came from external factors—like poverty and the lack of an education—that controlled an individual’s behavior. The latter is based on Cesare Beccaria and Jeremy Bentham’s four principal ideas: one, that people have the free will to choose how to act; two, deterrence is based on the fact that humans are hedonists who weigh the costs and benefits of their actions; three, that severe punishments can deter people from committing crimes; and four, that the more swift and certain the crime, the more effective it will be. After explaining the founding ideas behind criminology, Perez summarized what it means for our communities. “Traditionally the definition of criminality, considers marginalized groups as a threat. It’s believed that marginalized groups don’t work, that they drain the social resources, and are poor through many of the choices that they make, and should be punished for those choices,” said Perez. This traditional definition plays a role in the state failing communities and the strained relationship between law enforcement and community members. Changing topics, Perez spoke about the work that he does as a way to encourage others to seek alternate ways to defining criminality. “I go into my community and tell them about the history of a time period when people worked together to develop a community that was able to address crime,” he said. “I inform them about their rights when they’re under custody of the criminal justice system, so they understand what they can do and what shouldn’t take place.” Along with informing the community, Perez mentioned that it’s important to look at the causes of crime. “If you look at the U.S. in the 1960s, when communities were rioting, at the heart of that was housing segregation, lacking economic opportunities, a sense of hopelessness, and police brutality. When you look at all the instances since then, many of those circumstances are still around today,” said Perez. Rather than marginalizing minorities, Perez stated that it’s important to address these housing issues and lack of opportunities as a way to include young minority men in their community and help them succeed.